Lords Of Waterdeep Review: You're A Wizard, Harry – AiPT! 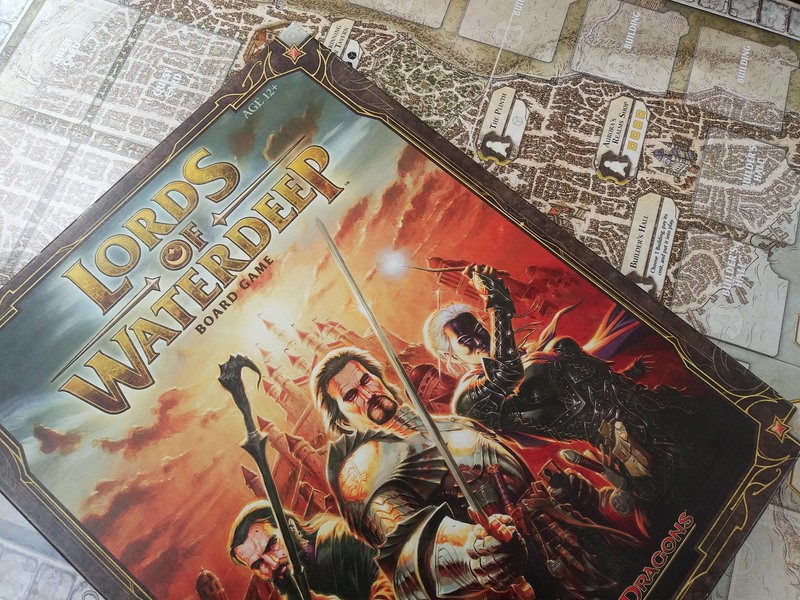 Lords of Waterdeep is an awesome board game that’s more thematic than it gets credit for. A lot of the criticism of Lords of Waterdeep that I have heard is that you don’t really end up feeling like one of those scary underworld bosses, because you’re not dealing with individual heroic stories, you’re dealing with little cubes. An orange cube is a fighter, a black cube is a rogue, and you’re not telling epic sagas, you’re pushing cubes around a board to complete quests, get gold, and have the most points when the dust settles. Ta-da! You’re an accountant, but D&D-themed. Nothing has made me feel as powerful, as legitimately the ruler of a vast empire of spies and mercenaries, as feeling so above all the tiny peons that they’re interchangeable cubes. This was one of the first few modern games I played after Settlers of Catan, and after our first play my husband strutted around the house for several days announcing “BUT… I AM THE LORD OF WATERDEEP!” whenever something didn’t go his way. Lords of Waterdeep is a pretty straightforward worker placement game with one major twist – unlike in static-option worker placement games, there is a chance every round for a player to purchase a building, which can then be used by other players to generate goods and resources, just like the standard worker spots on the board. I love this. It’s just plan satisfying. A lot of the strategy of the game comes from whether to use your opponent’s buildings – which gives them a sometimes-hefty reward – or to use yours, which gets you no reward but doesn’t benefit your opponent. It’s a decent game to play with players suffering from analysis paralysis, as you never have more than a handful of options available at any point. At the start of the round there can be an overwhelming number of options for some players, but everyone’s secret lord card gives them a direction to go if they can’t decide. People who don’t enjoy tedious tallying-up at the end might not love this game, because the last thing you do is sit around for a few minutes counting up points from quests and Lord cards. I don’t mind this, because it doesn’t go on forever and in my groups it’s nerve-wracking and fun to keep leapfrogging each other until the final quest card is put down. At that point, someone cheers, throws their hands in the air, and proclaims themselves the Lord of Waterdeep. This game is solid entertainment. I’ve played it more than a dozen times and I’ve never had a bad game. Every time I’ve played, there have been shouts across the table when someone took that spot another player had been waiting on the entire round – or played an intrigue card against them. Unlike some worker placement games, it feels interactive and tense. Playing a mandatory quest against your opponent at the end of the game can be downright brutal. The extra player is satisfying, and there are some interesting additions, but at $30, I’m not sure it provides enough content to be worth nearly the cost of the base game. I also find it extremely irritating that spaces for the sixth player were put on the base game board, but the components for that player were held off until the expansion. It makes it feel like a cheap money grab. When teaching this game to players who are new to Worker Placement games, they tend to start to grasp the whole picture and be competitive about halfway the way through their first game. If they’ve played WP games before, there is unlikely to be any problems picking this up with a five-minute summary and a few open-hand turns. The insert is cleverly designed – for the most part. Love some of the little touches, like the spot for the cards where you can press lightly on a deck and it pops up ready to be shuffled. However, the frustration of getting the fiddly little gem counters back into their designated spot takes off a point for me. Another point off comes from the texture of the cards, which don’t feel cheap, exactly, but have an almost gritty texture that makes them a little uncomfortable to shuffle. The price is on the medium-low end for a board game, at $35, and I am satisfied with what’s in the box at that price. Many people who love this game spend the $25 to upgrade to fancy D&D-themed meeples to replace the wooden cubes, but I’ve never felt the urge to do so. Thematic with fun D&D flavor. Easy for new players to learn. Interactive for a worker placement game. Long scoring phase at the end. Meaner than some people will enjoy. Harder to be competitive in your first play. Base game doesn't include 6th player components.